The US Navy is moving ahead with research and development towards the eventual construction of 12 ballistic missile submarines to replace the current OHIO Class (Trident) fleet of 14 subs. The current schedule would begin construction in 2019, with delivery of the first replacement sub by 2021. The OHIO Class fleet - also known as Trident because of the Trident ballistic missiles they carry - of ballistic missile submarines was initially developed during the height of the Cold War as the ultimate nuclear deterrent to the (then) Soviet Union. 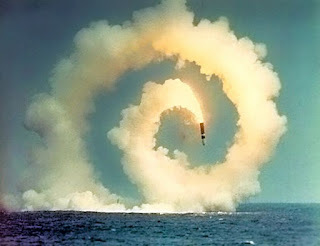 Ostensibly designed as a second strike weapon against the Soviet Union, Trident was (and continues to be) a potential first strike weapon as well. Long after the fall of the Berlin Wall and the need for a nuclear deterrent, the U.S. has continued to deploy the Trident fleet on patrol 24/7 on alert status, ready to launch thermonuclear armed ballistic missiles on command of the President. Each of the Trident submarines carries up to 24 Trident II D-5 missiles, each armed with up to 8 independently targetable thermonuclear warheads with yields of either 100 kilotons (W76 Warhead) or 475 kilotons (W88 Warhead). Currently, Trident missiles carry an estimated 4 warheads per missile. "A single Trident submarine is", as Rear Admiral Joseph Tofalo said in 2012, "the sixth largest nuclear nation in the world all by itself." Although we hear much about terrorists and rogue states in the context of nuclear weapons dangers, the greatest risk from nuclear weapons is still that presented by the nations that continue to deploy nuclear weapons. Furthermore, the nuclear armed nations (led by the U.S. and Russia) have failed to abide by their obligations under the Treaty on the Non-Proliferation of Nuclear Weapons, under which they are required to initiate good-faith negotiations toward disarmament. And now, beyond the continued deployment of the Trident nuclear weapons system and its modernization (W76 Life Extension Program), the U.S. is moving ahead with plans for New Trident. This plan is contrary to any efforts towards non-proliferation and disarmament and sets a dangerous precedent. The continued deployment of nuclear weapons and the modernization of every aspect of the nuclear weapons complex also drains precious funds that are desperately required for human needs - education, health care, essential infrastructure, to name just a few. Just construction of 12 New Trident subs will be approximately $100 billion!!! New Trident could be the tipping point in a new and uncontrollable nuclear arms race, one that will likely increase the probability of nuclear war and put all of humanity at risk. There is no upside to Trident (or New Trident)!!! Should humanity have to continue to face the probability of nuclear war and the disastrous consequences on life around the globe? Should we continue to deploy an outmoded, Cold War weapons system that has no military purpose in our rapidly changing world? Should we continue to spend taxpayer dollars on a useless weapons system ($100 billion just for starters!!!) when far too many human needs are unmet??? The NO To NEW TRIDENT Campaign seeks to stop the construction of New Trident and to re-direct those funds to human needs. NO To NEW TRIDENT is focusing on defunding the project through a concerted advocacy/lobbying effort with our legislators in Washington, DC. NO To NEW TRIDENT is a serious, grass-roots campaign started by concerned citizens who care about our children's future. We believe that there is no future in our continued reliance on (and the continued existence of) nuclear weapons, and that the Trident nuclear weapons system is a critical place to start the disarmament process. 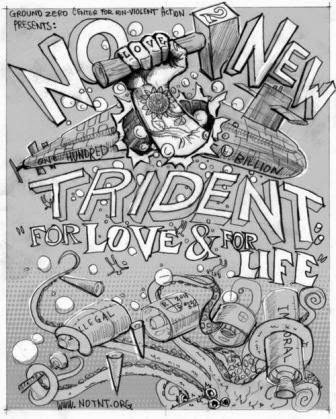 NO To NEW TRIDENT needs YOUR involvement!!! Experience has taught us that our government has not had the will (or perhaps intention) to make good faith efforts toward disarmament. It is time for citizens to raise our voices to make it happen. It will take a groundswell of public pressure to convince the decision makers to scrap New Trident and spend that money on human needs. Please join us. Sign up to receive our newsletters, announcements and opportunities to get involved. Click here to sign up for our mailing list (we do not share it with any other entity). Spread the word about the campaign. Share our website with others; it's easy to remember - notnt.org. We also have a NO To NEW TRIDENT Facebook page. Like us and share it widely. NO To NEW TRIDENT seeks to stem the tide of nuclear weapons proliferation so that we can move toward disarmament and a safer world for future generations. Together we speak with one strong, clear voice to help create a more secure world for future generations. Please join your voice with us.